Northwestern Engineering’s Peter W. Voorhees is among six Northwestern University faculty members elected into the 236th class of the American Academy of Arts and Sciences, one of the nation’s oldest and most prestigious honorary societies. A total of 213 leaders in the sciences, social sciences, humanities, arts, business, and public affairs were elected into the academy this year. They will be inducted at an October 8 ceremony at the academy’s headquarters in Cambridge, Massachusetts. Voorhees is the Frank C. Engelhart Professor of Materials Science and Engineering and (by courtesy) professor of engineering sciences and applied mathematics in Northwestern’s McCormick School of Engineering, where he studies the kinetics of phase transformations — ranging from the growth of nanowires to solidification of alloys — using experiments, simulations, and theory. 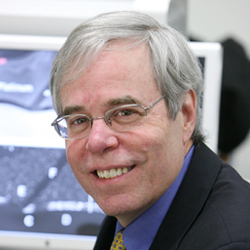 Over the years Voorhees has received a number of awards and honors, including the J. Willard Gibbs Phase Equilibria Award from ASM International, National Science Foundation Presidential Young Investigator Award, and induction as fellow into The Minerals, Metals and Materials Society and ASM International. The Institute for Scientific Information named Voorhees as a highly cited researcher in 2002. He also received McCormick’s Award for Teaching Excellence and was named Materials Science and Engineering Teacher of the Year three times. Founded in 1780, the American Academy of Arts and Sciences is one of the country’s oldest learned societies and independent policy research centers, convening leaders from the academic, business and government sectors to respond to the challenges facing the nation and the world. Current academy research focuses on higher education, the humanities and the arts; science and technology policy; global security and energy; and American institutions and the public good. The five other Northwestern faculty elected this year are: Bernard S. Black, Bryna Kra, Carol D. Lee, Eric G. Neilson, and Michael R. Wasielewski.